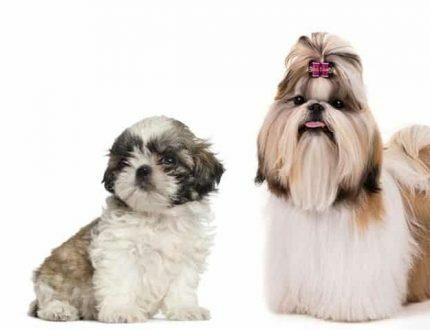 Your dog is not only your best friend, but he is also a full-fledged member of the family. So, when it comes time to go to bed, you want your dachshund right there with you and he wants nothing else. Sleeping with your dog is not only good for your health and mental state, but it is also good for your relationship with your dog. However, for so many people this is not a reasonable setup. Many people are allergic and can’t be that close to their dog. For others, they actually don’t get comfortable to sleep well themselves if their dog is in the same bed. With a dachshund you have very little leg room if they are in your bed, laying perpendicular to you. Last but not least there are reasons a dachshund should not sleep in your bed for their own health. This means your dachshund needs a bed of his own. The question is which one? 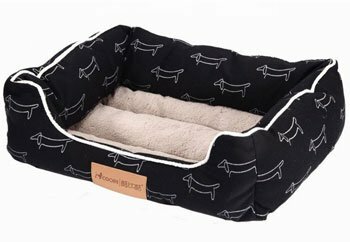 What is the best dog bed for dachshunds? There are three types of dachshunds – the short hair, long hair, and wire hair. They are, however, all the same in basic size and weight. So, your bed choice is not influenced by the type of dachshund you have. It is, however, influenced by the dachshund breed itself. They are short and long. They tend to have back issues and should not be jumping on or off couches and beds. 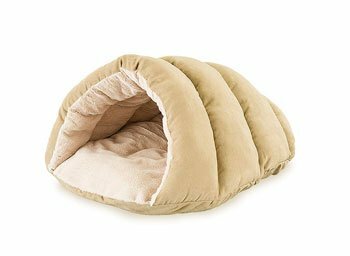 You need a low dog bed and since they love to burrow, the tent or covered type beds are a favorite for them. 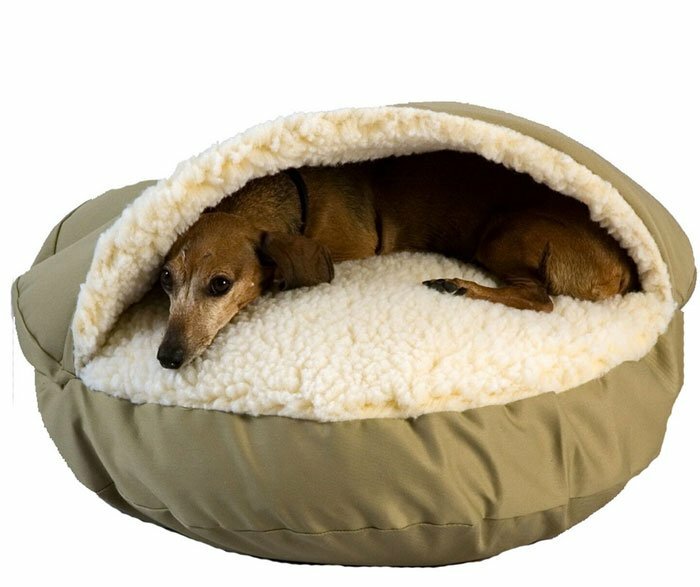 As you review our choices for the best dog beds for a dachshund, keep in mind what your dog needs. They need their bed to be easy for them to get into without any jumping up or jumping down to get out. Your dog has a long, fragile back and likes to have support when he curls up. Finally, the dachshund is a breed that burrows so maybe he needs a bed that allows for that activity. Price is dependent upon features. Although this is the most expensive bed we recommend, it is also the most popular. This is due to all the features that are available in this line. For about $100 you get the basic of a great burrowing dog bed. The lining is soft and cozy Sherpa, made for summer cool and winter warmth. The more expensive picks it up a bit with the same Sherpa and design with the addition of Microsuede exterior and two inches of polyester foam and a sleep surface that is extra deep. Finally, the most expensive model adds the same two inches of foam, but it is orthopedic foam. Heavy duty and rust proof zipper made of brass. 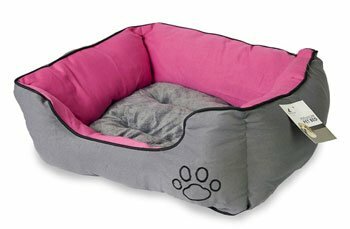 This 25 X 20 X 5.5 sized premium dog bed is a great buy. For the price, you get two and one-half inches of comfortable memory foam. It will help with joint pain and improve energy. It is then filled with recycled poly. It’s designed to provide your dachshund with a comfortable base and supportive bolsters on three sides. Some dogs like to rest their heads on the bolsters and others do not. This bed gives them a choice. It’ll look great in your house too and it’s easy to clean. It is certified to the European REACH standards so that the soft cover is safe for your dog’s skin. Don’t be fooled by the price, this is an excellent bed. However, it is the only one on the list that is not either burrowing or bolstered. This is a typical rectangular bed. 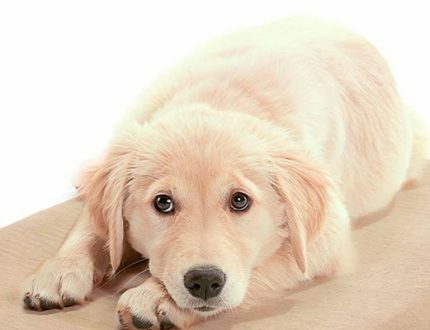 What makes it special enough to make this list is the materials it is made from and the commitment to your dog’s comfort. This bed features three inches of “shredded” memory foam, doing away with all pressure points and letting the foam breath. It is lightweight and portable, just throw it in the car and you are off. It is particularly great in dog crates for extra support. The exterior is washable microsuede and it offers a three-year warranty in the U.S. I know, the beds are getting less expensive but don’t let the prices influence your decisions. Yes, our favorite bed is the most expensive, but this little tent has much to offer your dachshund. It has a lining of polyfoam and linen, faux suede or corduroy choices for the exterior. This is a plush, good looking tent bed that will mesh into your home design no matter where you put it. Your dachshund will be comfortable and snug in the 19 X 19 X 19-inch bed. Machine washable and easily portable, it is designed to last for years. Now you are saying this can’t possibly be that good of a bed for you beloved dachshund for this price. Don’t believe it. Your dachshund will love the space and snuggly walls of this 22 X 16 plush bed. The bottom of the bed is made of a fabric that will not skid regardless of the floor type you place it on. It is filled with 100% plush polyester. It’s a good looking gray and pink that will fit easily into your home décor. This one is called a sleeping bag and it is great for outdoor camping if you and your animal friend enjoy that. However, it is as good for snuggling by your dachshund as any bed on this list. Your dog will love being surrounded by the thick fleece and Sherpa. It can snuggle your dog until you can’t see him, or he can stretch out and put the sleeping bag over his head like a hood. Burrowing breeds love this bed. Yes, it is machine washable and it is made in the U.S.A. You know by the name of the product that it’s meant for your “Weiner dog”. 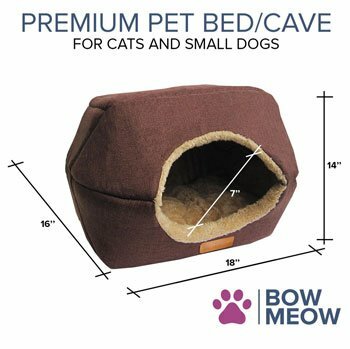 This bed/cave is made by a small family company making high-quality products for the dogs and cats that they themselves share their lives with and love. It is a cave that your burrowing little dachshund is going to love. This actually a two in one product that is more than worth its cost. Your dachshund can hide and burrow in the cave or you can turn it into a plush mat with a pillow for stretching out. Designed for small dogs like yours, the cave is still spacious at 18 X 16 X 14 with a 7” opening. It looks great and it feels great to your dog. Made of the best materials it is warm in the winter and a cool mat in the summer. The bottom is non-skid and the whole cave is durable and guaranteed. The name of this bed sofa says it all as does the design and iconic material. Your dachshund might not notice the cute little dachshund motif, but you will, and your guests will. Made of 100% of the highest quality cotton, the dachshund size sofa is 45 cm X 35 cm X 15 cm. The bed is made of a synthetic faux fur with polyester padded bolsters. It’s durable, won’t slip on any type of floor, waterproof, but most of all it is soft. Soft and cuddly for your cuddly dog. What makes this cave special? Well, there are several things beginning with the name Ethical Pets. This is a company committed to the best products and the least cost to you with the most ethical company policies and processes. This is a plush, cozy tent that your dog can escape to and feel both safe and cuddled. It looks good in your house with a plush interior and faux suede exterior. The fill will not shift or clump. It won’t change shape even in the washer. It is 100% safe for your dog, but you wouldn’t expect anything else from an “Ethical Pet” company. What about that company? Privately owned and committed to the highest quality in products they are dedicated to your pets. Their customer service, honesty, and integrity are second to none. 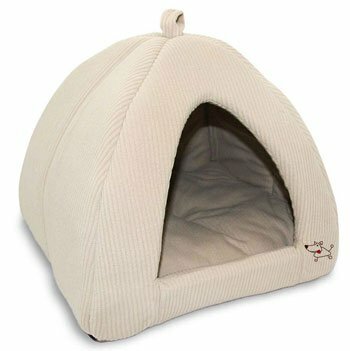 If who you buy from is as important to you as what you buy, then take a look at this cozy cave from Ethical Pets. It comes in many colors and you can find one to match your home décor. Last but certainly not least is one of the more expensive units on our list. It is worth the price. This bed was made for cuddling your dog. It was made for the canine that loves to burrow in and cover up with a soft, cozy hood. The bed lining is faux lambswool, so soft and gentle on paws and noses. The exterior is Faux suede and it is so comfortable and healthy for your little guy. Protect your little dog from back injuries or sore joints with the egg crate foam that is orthopedic quality. The egg grate design also improves your dog’s circulation. Because it is a therapeutic design and cushioning it affords the dog with restorative, deep sleep. Just don’t use it for dogs that are teething or have serious chewing issues as it won’t stand up to that behavior. 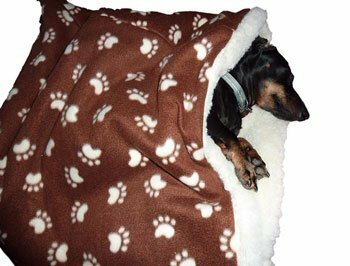 Your dachshund will be adorably cute with their body burrowed into the snuggery and their heads sticking out of the blanket like top. Those are our top ten best dog beds for dachshunds. The top of the line for us being the soft, foldable, warm cave from Snoozer. Across the board on many different sites and in many different articles, this bed came up as the best over and over again. On a scale of 1 to 5 its average score was a 4.5. Why? Because your dog can go inside and hide there comfortably doe hours if she wants to. Because your burrowing breed of dog can burrow into this comfortable space instead of burrowing under your covers in your bed. Whether you choose the Snoozer or another bed on this list, just remember that the best bed for a dachshund is low to the floor so she won’t have to or be able to jump up and down. This will save her spine and your furniture! They need their own bed. They need a safe place to snuggle and feel safe. They need support for their back and their joints in their short legs and hips. The best bed for your dog might be a challenge with all the choices out there. 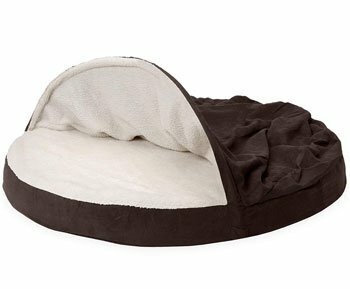 Remember that the 3 types of beds best suited to dachshunds are the oval shape, the donut shape, and tent/cave design. Some will enjoy the couch with bolsters but for most dachshunds, it wouldn’t be the first choice. So, there you are – our choices for the ten best dog beds for dachshunds. 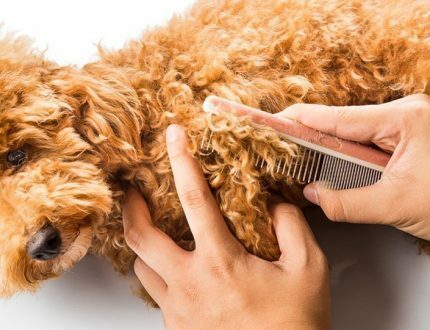 If you want the top of the line or you want to spend a little less, you should be able to find what your dachshund needs on this list.